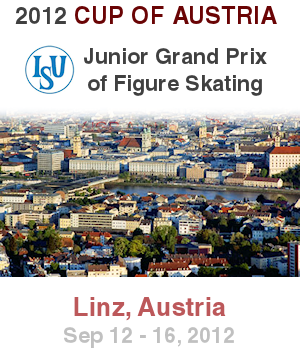 The 2012-13 ISU Junior Grand Prix of Figure Skating continued this week in Linz, Austria, with approximately 116 skaters/teams representing 34 countries competing in the Men, Ladies, Ice Dance, and Pairs disciplines. The athletes competed to earn points towards qualification for the ISU Junior Grand Prix (JGP) of Figure Skating Final which will be held in Sochi, Russia in December. France’s Gabriella Papadakis and Guillaume Cizeron won their second consecutive JGP gold at this event, while Anna Yanovskaya and Sergey Mozgov of Russia took the silver. Canada’s Mackenzie Bent and Garrett Mackeen slipped to third, pocketing their second JGP bronze. The medal winners all gave solid short dances, and only a .01 points separated the Russians and Canadians. Papadakis and Cizeron, both 17, placed first with 59.19 (31.79/27.40) points after displaying strong level four twizzles and pocketing many positive Grades of Execution (GOE) for their level three midline steps. The French team also did well in their free dance to a Pink Floyd medley, earning 69 positive Grades of Execution (GOE) out of a possible 72 for their elements. The team displayed good level four lifts, as well as strong level three circular and diagonal steps in their smooth and powerful routine. The 2012 JGP Courchevel champions placed first in the free dance with 82.89 (40.21/42.68) points, and with a total score of 142.08, won their second consecutive JGP event. In the short dance, Yanovskaya and Mozgov impressed with a level four rotational lift, which garnered +2s GOEs across the board, however, the team only met one of their six key points in the blues patterns. Nevertheless, they showed very good level three circular steps, and finished third in a near tie with the Canadians with 54.30 (27.22/27.08) points. In their expressive free dance, the current JGP Final silver medalists opened with strong level four twizzles, earning +2s GOES across the board. The Russian team also performed three level four lifts, however, their circular steps were only a level two. They finished second in the free dance with 80.72 (39.40/41.32), beating the leaders in the components scores, and with a total score of 135.02, rose to second overall. Although Bent, 15, and Mackeen, 18, met all six key points in their blues patterns, their twizzles were only graded a level one. However, their level three midline steps and level four curve lift were awarded positive GOES, and they finished second with 54.31 (30.00/24.31) points. The team from Ontario were solid and showed confidence in their free dance to Misterio Y Fuego, displaying good level three twizzles and diagonal steps. They finished third (74.85) in the free dance and overall (129.16). Shari Koch and Christian Nuechtern of German finished fourth (117.56), followed by Ukrainians Alexandra Nazarova and Maxim Nikitin (114.05). USA’s Rachel Parsons and Michael Parsons, who stood in fourth after the short dance, placed eighth in the free dance and sixth overall. Brittany Jones and Ian Beharry of Canada captured the gold in their international debut together as a team. Russia’s Lina Fedorova and Maxim Miroshkin moved up from fourth to second overall to win the silver, while teammates Maria Vigalova and Egor Zakroev maintained third place for the bronze. Jones, 16, and Beharry, 20, delivered a nearly flawless short program which featured a huge throw triple Salchow. The skaters, which have only been together several months, also produced good side-by-side double Axels, a double twist, and a level four lift and pair spin. They were awarded first place with 51.70(28.52/23.18) points for their Bollywood-themed routine to Bombay Awakes from the “Bombay Dreams” musical. In their long program to Vivaldi’s Winter and Summer from “Four Seasons”, Jones and Beharry had problems with the catch in their opening triple twist, and Jones later fell on a throw triple Salchow. The Canadians otherwise landed side-by-side triple toes, a throw triple loop, and earned a level four for their lift and two spins. They place first in the long with 101.08 (50.02/52.06) points, and were the overall winners with a total score of 152.78 points. Fedorova, 14, and Miroshkin, 18, were also solid in their short program to Singing’ In the Rain, earning the highest total element score of the event. The team impressed with a level four double twist, double Axels, and a very good throw triple Salchow, and earned a level four on both their lift and combination spin. They placed second with 50.63 (28.68/21.95) points, trailing the Canadians by just over a point. However, the Russians did not fare as well in their long program. While the team opened with a huge triple twist, Miroshkin took extra steps after the first jump in the double flip-double toe combination, and Fedorova fell on the double Axel. The 2012 Youth Olympic Games junior silver medalists otherwise produced a good throw triple Salchow and good lifts, but received a deduction for a time violation. They finished fourth with 92.86 (46.81/48.05) points in the long and second overall (143.49). Vigalova, 13 and Zakroev, 19, placed fourth (6.28) in the short program with their jazzy routine, displaying a good triple twist and throw triple Salchow, as well as a level four lift, pair spin, and straight line footwork sequence. In their dramatic long program, Zakroev singled the first jump and touched down with his hand on the second in a side-by-side double Axel-double Axel sequence. The Russians were otherwise solid in all other elements, earning many positive GOEs for their triple twist, throw triple loop, and throw triple flip. They earned the highest total element score, finishing second in the long with 96.50 (50.88/45.62) points. With a total score of 142.78, the team rose to third overall in their international debut. Xiaoyu Yu and Yang Jin of China, who placed third in both the short and long, missed the podium by a mere .51 points, placing fourth overall (142.27). In their short program to a violin concerto, the 2012 World Junior silver medalists impressed with a very good throw triple Salchow, double Axels, and a double twist, however, they encountered problems with their lift. In their long program to Die Fledermaus, Yu underrotated her jump and fell on the opening triple toes and later had problems on the double Axel-double Axel sequence. The Chinese bronze medalists otherwise executed a good throw triple Salchow, triple twist, throw triple loop, and a good level three backward inside death spiral. They placed third in the long with 94.45 (49.58/45.87) points. USA’s Britney Simpson and Matthew and Matthew Blackmer finished fifth with 133.05 points, while teammates Jessica Calang and Zack Sidhu were sixth (123.88). USA’s Nathan Chen was the clear winner of the men’s event, taking the gold with over 36 points to spare in his international debut. Japan’s Ryuju Hino won his second JGP silver medal, while Jin Seo Kim of South Korea, also making his international debut, catapulted from 10th place to win the bronze. Chen opened his short program to Praeludium and Allegro by Fritz Kreisler with a solid triple Axel, and followed up with two very good level four spins, a triple Lutz-triple toe, and a triple flip. The 13-year-old also displayed very good level four straight line footwork, and place first with 75.15 (43.05/32.10) points. The U.S. Junior champion was just as flawless in his long program to music from The Three Musketeers soundtrack, landing a total of eight clean triple jumps, including a triple Axel. He also earned many positive GOEs on his level four footwork and spins, placing first with 146.85 (79.51/67.34) points. With a total score of 222 points, Chen easily dominated the event for first place overall. Hino opened his short program with a good triple Axel, however fell out of the landing of the second jump on a triple Lutz-triple toe, and later received an edge call on a badly landed double flip that was meant to be a triple. The 17-year-old otherwise displayed good spins and footwork, placing third with 60.41 (33.41/27.00) points. The Japanese junior champion opened his long with a triple Axel-triple toe, but once again, received an edge call on a triple flip. He also fell out of the second jump on a double (meant to be a triple) Lutz-triple toe, and fell on a triple Axel. The skater otherwise landed three move clean triple jumps and earned a level four on all three of his spins to place third with 125.44 (69.88/57.56) points. Although the 2011-12 JGP finalist placed third in both segments of the competition, he finished second overall with a total score of 185.85 points. Kim, who stood in 10th after the short program, rebounded in his long routine to music from Cirque du Soleil, placing second with 126.27 (71.07/55.20) points. The South Korean skater landed a total of eight good triple jumps with only the flip receiving a edge call. The 15-year-old also earned positive GOEs for his level three straight line footwork, placing third overall (175.87) to win the bronze in his international debut. Peter Coufal of the Czech Republic narrowly missed the podium with 175.72 points. The 17-year-old put out two solid programs, however, did not have a triple Axel. Elena Radionova of Russia dominated the ladies event, winning her second consecutive JGP gold with more than 24 points to spare. USA’s Hannah Miller won the silver, while teammate Samantha Cesario rose from fourth place to win the bronze. Performing to music from the Fifth Element soundtrack for the short, Radionova landed a triple Lutz-triple toe, followed by a triple flip and double Axel. The 13-year-old also displayed very good level four spins and a level three straight line footwork sequence. She was awarded positive GOEs on all elements, and placed first with 62.71 (36.80/25.91) points. The Russian junior bronze medalist was equally flawless in her long program, landing a total of seven solid triple jumps. Once again, she was awarded with positive GOEs for all her elements, including her level four spins and level three footwork. Her layback spin, in particular, earned seven +3 GOEs, and the 2012 JGP Courchevel champion placed first with 120.15 (66.39/53.76) points, and overall with 182.86 points. Miller had a clean short to Tanguera by the Sexteto Mayor which featured at triple loop-double loop, triple flip, and double Axel. The U.S. junior bronze medalist impressed with strong spins, and was the only competitor to receive a level four for her footwork sequence (straight line). She placed second with 55.47 (31.97/23.50) points. In her long to The Storm by Balázs Havasi, the 15-year-old landed five triple jumps, but received an edge call on the Lutz. She also underrotated a triple loop (in combination with a double loop), but otherwise produced good spins, finishing third with 103.05 (54.57/48.48) points. With a total score of 158.52 points, she was able to maintain second overall. Teammate Cesario placed fourth in her “Black Swan” short program, which featured a triple loop-double toe, triple flip, and double Axel. The 19-year-old also produced good spins and footwork, earning 54.38 (31.12/23.26) points. The American had a near-perfect performance in her long to Carmen Fantasie, however, she received an edge call on her opening triple Lutz and later underrotated her firs jump in a double Axel-double Axel sequence. Nevertheless, she showed good footwork and spins, finishing in second with 103.34 (55.85/47.49) points, and third overall (157.72). With the exception of an edge call on a triple flip, Ziquan Zhao of China gave a solid performance to Moonlight Sonata, placing fifth with 53.87 (31.47/22.40) points. The student from Beijing had three falls in the long program in which she placed fourth (92.35), and with a total score of 146.22, placed fourth overall. Hae Jin Kim of South Korea, who stood in third after the short (54.46), placed ninth in the long and fifth overall (141.29). Canada’s Gabrielle Daleman finished sixth (139.77), followed by Maria Stavitskaia of Russia (136.71).